It takes little to excite me when I am out in the field, but back on July 13 I happened upon a spider that was new to me. My wife and I were hiking in Lovell Gulch, just outside of Woodland Park in Teller County, Colorado, enjoying the mixed conifer and aspen forests at an elevation of roughly 8,500 feet. 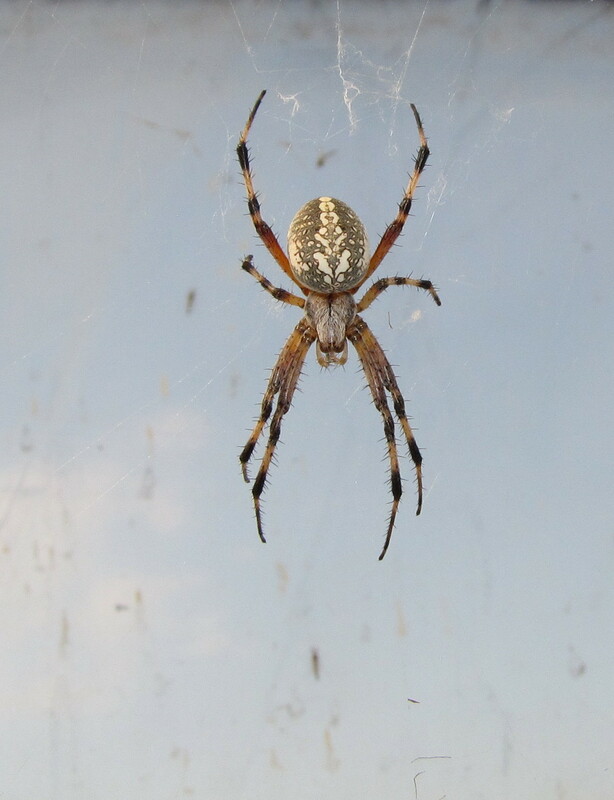 I seem to recall watching an insect in flight when an orb weaver spider caught my attention. The underside of the spider was most visible as it sat in the hub (center) of its wheel-like web, so I maneuvered as best I could to get a dorsal (top side) view. 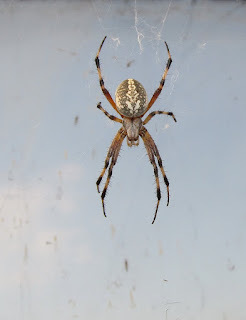 My initial thought was that this was a spider I had seen dozens of times: the Western Spotted Orb Weaver, Neoscona oaxacensis. Still, something seemed a little bit "off," and sure enough the ventral markings on this spider's abdomen were very different from that of a Neoscona species. Once I got back home, I tried my hunch that it might instead be a species of Aculepeira, even though I had never seen a specimen before. Indeed it was. It turns out that this genus is pretty much restricted to high elevation, and/or high latitude habitats. The three North American species are collectively found from Alaska and the Yukon Territory to northern Mexico. There are also a few records in the northeast U.S. One undescribed "prairie species" has been discovered in western Washington state. This one is almost certainly Aculepeira packardi, but it takes a microscopic examination of the genitalia of adult specimens to be conclusive. Note that the species name in older references is spelled with two "i"s: A. packardii. The other two species here are A. carbonarioides and A. aculifera (which reaches Guatemala). 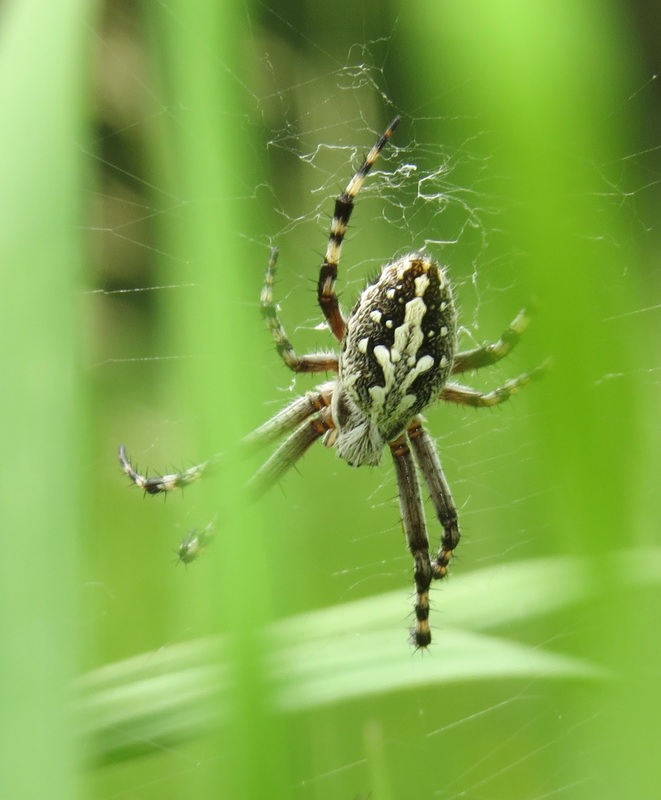 Normally, the adult female spider hides in a silken retreat on the periphery of her web during the day, but this was a mostly cool, overcast day, so she may have felt comfortable occupying the center of her snare. 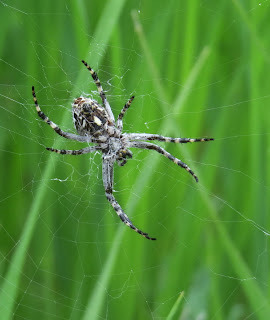 The web was strung between the branches of a very low-growing shrub on a gentle slope in an open meadow. 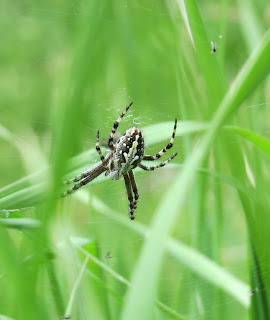 These are good-sized spiders, mature females averaging nearly 11 millimeters in body length, males about 6 millimeters. The markings are pretty consistent, too, which does help a little bit in determining the species. Interestingly, A. packardi also ranges in the Russian far east, Siberia, and northern China. In North America, it ranges from the Yukon to Labrador, and south to Chihuahua, Mexico and Pensylvania. Sources: Balaban, John and Jane, et al. 2015. "Species Aculepeira packardii," Bugguide.net. Dondale, Charles D., James H. Redner, Pierre Paquin, and Herbert W. Levi. 2003. The Orb-weaving Spiders of Canada and Alaska (Araneae: Uloboridae, Tetragnathidae, Araneidae, Theridiosomatidae), The Insects and Arachnids of Canada Part 23. Ottawa, Ontario: NRC Research Press. 371 pp. Schimming, Lynette. 2013. "Genus Aculepeira," Bugguide.net. We have had an exceptionally wet, cool spring and summer here along the Front Range; and perhaps it was raining lady beetles, because there are more coccinellids than I have ever seen before. 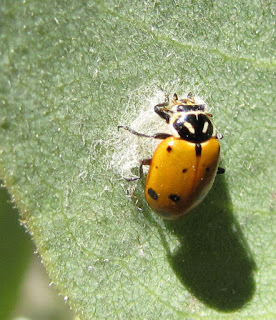 With the lady beetles come their insidious parasite, a wasp in the family Braconidae that goes by the name of Dinocampus coccinellae. 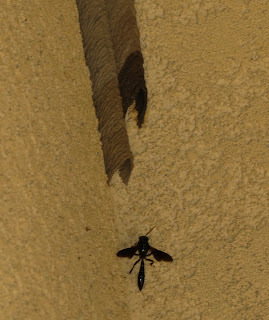 I first encountered the work of these bizarre wasps in southern California. 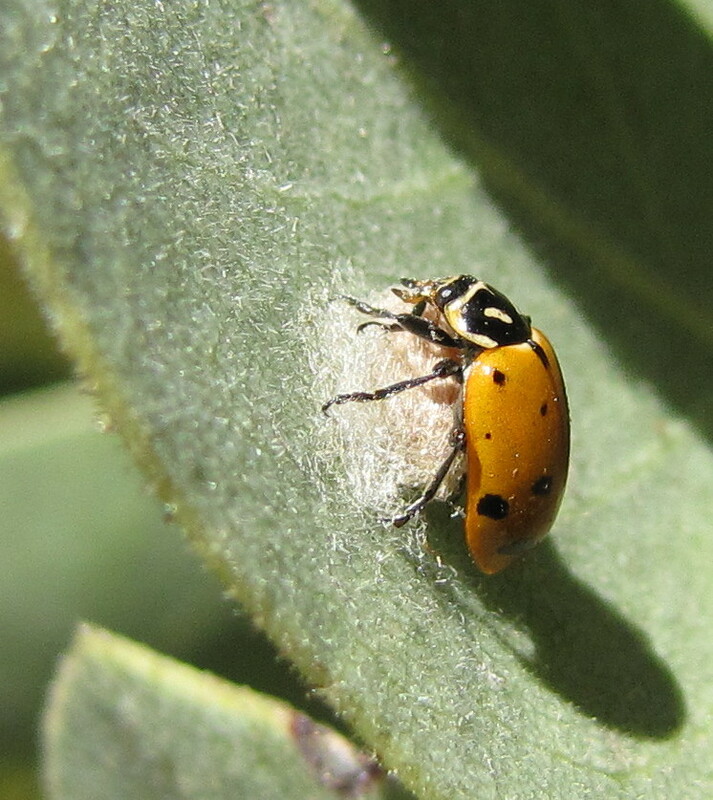 Upon close inspection of a surprisingly inert Convergent Lady Beetle, I found it had beneath it a silken cocoon. I had heard of Dinocampus before, but never seen any life stage in person until then. 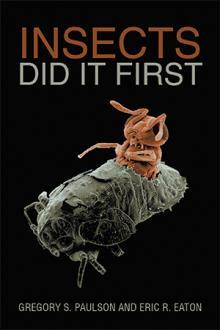 What scientists have discovered about the species since then is nothing short of mind-blowing. Ok, so the tiny female wasp sneaks up on an unsuspecting beetle and drives a single egg into its body using her spear-like ovipositor. The wasp larva that hatches then begins feeding as an internal parasite of the beetle. It may not kill its host, however. No, what happens is far more weird than that. An article on the National Geographic website describes a fascinating if not frightening addition to the wasp versus beetle equation. Besides laying an egg in the host, the wasp also deposits a virus. This virus, called D. coccinellae Paralysis Virus (abbreviated "DcPV"), takes up residence in the wasp larva where it replicates. Once the wasp larva is ready to enter the pupa stage, the virus migrates to the beetle host's nervous system where it has a paralyzing effect. The wasp larva then exits the beetle and spins a silken cocoon beneath it. 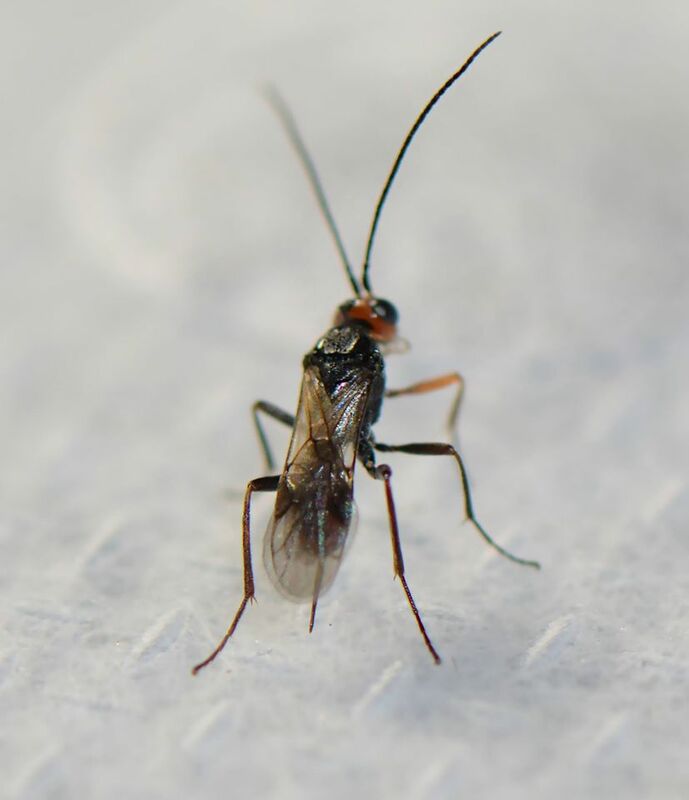 While the host is helpless to move of its own free will, the virus apparently triggers periodic twitches in the beetle, enough to make it appear capable of attacking any potential parasites of the wasp cocoon. 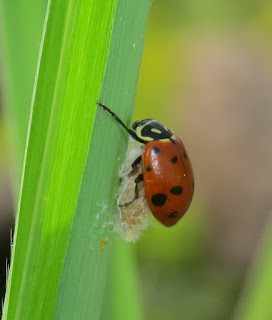 Since lady beetles themselves are well-defended by toxic alkaloid chemicals in their bodies, it is unlikely any predator would attempt to attack the beetle and the wasp cocoon it is guarding. Ironically, a volatile chemical compound given off by lady beetles is what may attract the parasitic wasps to being with. My wife found one of these beetle-and-cocoon conglomerations on the leaf of a tomato in our community garden plot here in Colorado Springs; and I found another one attached to the blade of an ornamental grass at my workplace, a plant nursery, also in Colorado Springs. Meanwhile, a friend from Facebook, Ryan Nefcy, found his own specimens and committed to rearing out the wasp. Rayan's stunning pictures of the miniscule wasp are shown here. His images are all the more remarkable considering ".... this thing hatched and it is SO FRICKIN SMALL. And it's moving at 100 mph trying to find a way out of the vial I have it in," as Ryan put it in one of the comments on his Facebook postings. Ryan collected the lady beetle and cocoon on August 12, and the wasp emerged on August 21. The lady beetle host also resumed normal mobility in the aftermath, as about one-third of the victims recover from the whole ordeal. Dinocampus coccinellae is found pretty much worldwide, and is not specific as to which lady beetles it uses as hosts. Presumably, the larger the host the better, but most victims here in the U.S. appear to be either the Convergent Lady Beetle or the introduced (from Europe) Seven-spotted Lady Beetle. 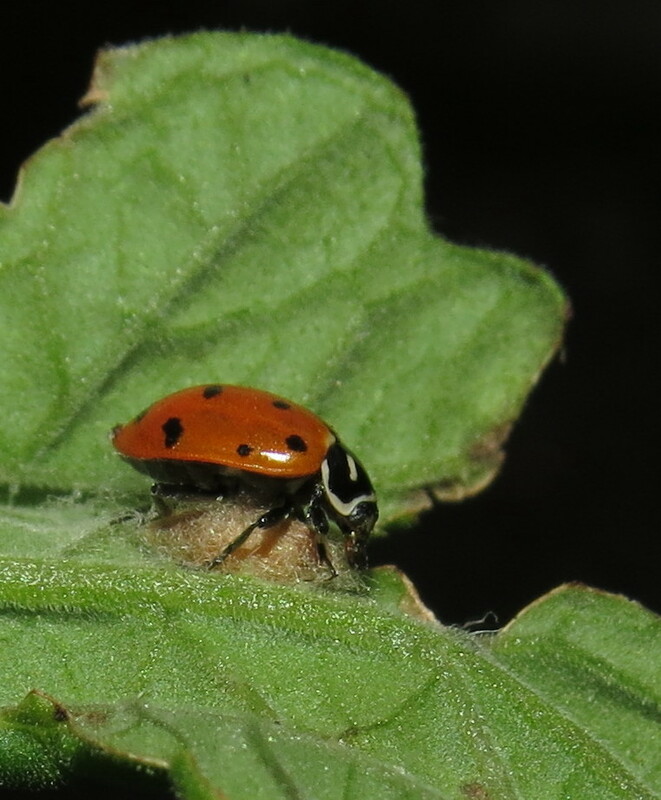 Because lady beetles are important predators of aphids, scale insects, and other pests, there is at least mild concern over the impact of the braconid parasite, especially in agricultural systems that rely on biological control. Female beetles may be preferentially targeted; and the feeding activities of the wasp larva may even sterilize the host, which means that even if a victim recovers, it will be unable to reproduce. 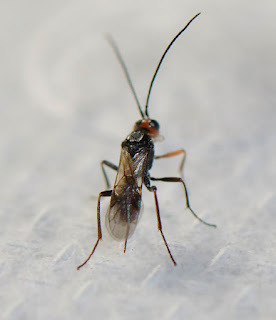 This has been one of the most-studied members of the family Braconidae, and one may find numerous scientific papers in professional journals and online. Sources: S. Al Abassi, M.A. Birkett, J. Pettersson, J.A. Pickett, L.J. 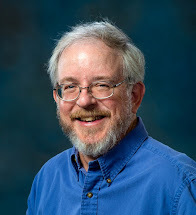 Wadhams, and C.M. Woodcock. 2001. 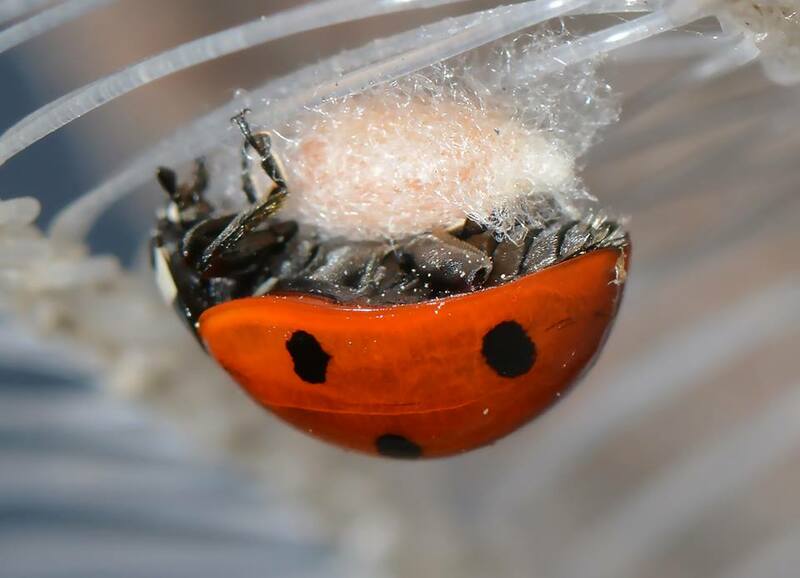 "Response of the Ladybird Parasitoid Dinocampus coccinellae to Toxic Alkaloids From the Seven-spot Ladybird Coccinella septempunctata," J. Chem. Ecol. 27(1): 33-43. Schimming, Lynette. 2009. "Species Dinocampus coccinellae," Bugguide.net. Having "Google Alerts" on my name and blog title provided an unexpected bonus last week. 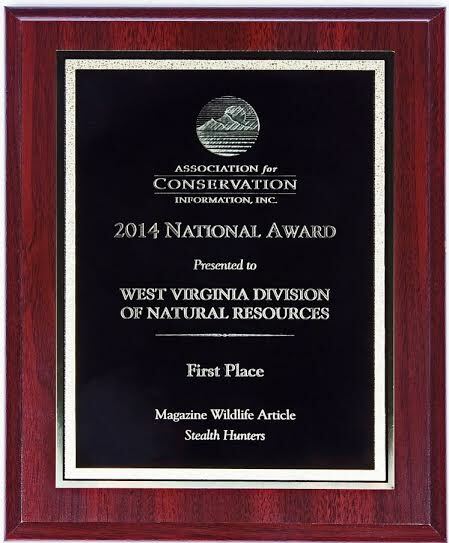 It turns out that one of my magazine articles won an award from the Association for Conservation Information. The award was for first place in the "Magazine Wildlife Article" category, and awarded to Wonderful West Virginia magazine. My article "Stealth Hunters," about assassin bugs, took the prize. Curiously, the Google Alert was to a television news story that mentioned me by name. The award itself did not. However, Wonderful West Virginia changed publishers and staff recently, so that may account for why they never notified me themselves. I honestly don't think about potential accolades when I am writing. I strive to write captivating, informative, and understandable prose of a quality that I am proud to put my name on. Feedback from readers and blog followers is even more appreciated than recognition in the "red carpet" sense. I have peers who I think far exceed me in skill, knowledge, and initiative, and I hope they are recognized and appreciated, too. It literally "takes a village" to spread the word about fauna, flora, and the need to conserve habitats. I owe a huge debt of gratitude to one Wendy Miller who, as my pro bono attorney, successfully wrote more DMCA takedown notices than we can count and finally managed to convince Google to remove the blog that has been a clone of this one. I thank the rest of you for your patience during this period. Meanwhile, I have been receiving excellent advice on how to install code to prevent, or at least hamper, efforts to steal content from this blog. I am learning more than I ever cared to. For example, my great friend "Bug Gwen," an outstanding blogger in her own right, told me that in most theft cases like this, the thief exploits the RSS feed. Gwen suggested shortening my feed instead of letting the feed carry the entire blog post. I have done this, but already received a vociferous complaint from one of my loyal followers who does not like to have to open a browser and click through to the full post. So, I have created a poll to learn what the rest of you prefer. I will act according to your collective wishes, but I do ask that you consider what I just went through. Should "Bug Eric" RSS feed be restored to "full?" Another technical whiz suggested embedding code into my blog's template to prevent indirect copying of text and images. I have done this as well, but it won't prevent someone from copying and pasting directly, if I understand this correctly. There seems to be no way of making one's creations completely theft-proof, but I understand those risks. However, only now am I learning what I should have done in the first place. Thank you again for your loyalty, I look forward to resuming something closer to a normal posting schedule from here forward. 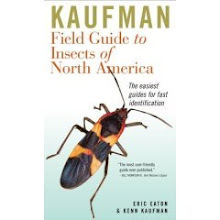 Yet another insect species appears to be expanding its range into eastern Colorado. 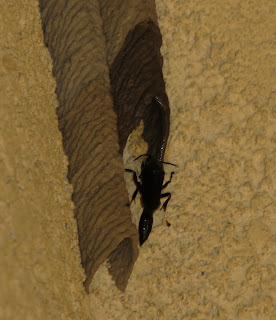 I have recently discovered nests of the Pipe Organ Mud Dauber, Trypoxylon politum, at three locations in the vicinity of Colorado Springs. This species is common throughout the eastern United States, but was previously known only as far west as Kansas and Nebraska. It is named for the multiple tubular mud columns that comprise its nest, and resemble the pipes on old-fashioned organs. Trypoxylon politum is not related to the familiar Black and Yellow Mud Dauber, or the Blue Mud Dauber, both of which are in the family Sphecidae. 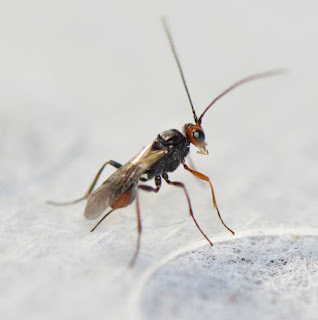 The Pipe Organ Mud Dauber is a member of the family Crabronidae, collectively known as "square-headed wasps." This is our only North American member of the "fabricator species group" of Trypoxylon that create free-standing mud nests. Most Trypoxylon species nest in pre-existing cavities such as nail holes, beetle borings in wood, and hollow stems or twigs. 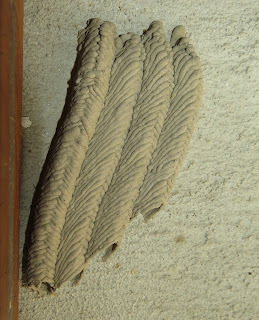 My wife then discovered a second nest on the inside wall of a wildlife viewing shelter in Fountain Creek Regional Park, on August 3. The park is located between the towns of Security/Widefield and Fountain, in El Paso County south of Colorado Springs. 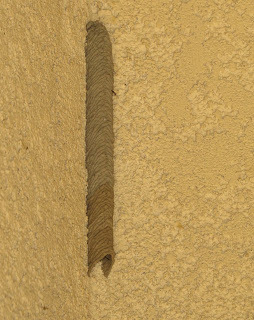 The longest column in this nest measured at least five inches. You cannot say these wasps lack ambition. One female created this entire nest. Most recently I discovered a single-column nest on the exterior of the Bear Creek Nature Center, also located in Bear Creek Regional Park, Colorado Springs. That was yesterday, August 13. Well, it was a single-column nest. This morning, August 14, I discovered the female wasp completing a second tube. I managed to get a few grainy images and a couple nice videos, which I am sharing here. A bit of architectural information. Each tube is partitioned on the inside into several individual "rooms," constructed individually from back to front inside the tube. 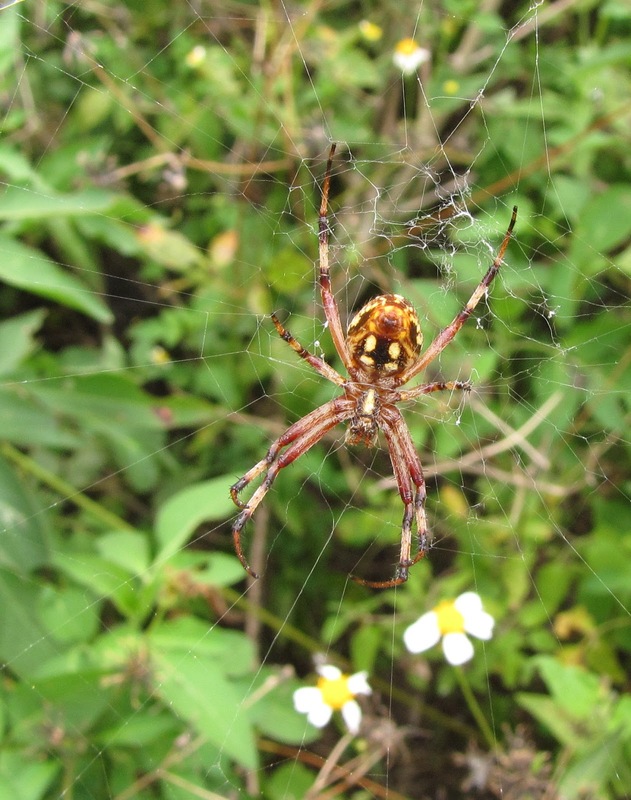 The female wasp hunts spiders, especially orbweavers, paralyzing them and caching several per cell, laying an egg on the last victim before creating a mud partition and beginning the process again. She continues this until the column is filled. The column itself resembles braided hair. One ball of mud, carried by the wasp up to the nest, is rolled into a thin half-arc. The next load is used to create the opposing, complimentary half-arc. Watch it happen in this video. The female wasp works with astonishing speed. She could fly away and return to the nest with another ball of mud in about sixty seconds. Sometimes, females work in tandem with a male. The male has a spine resembling a fishhook on the underside of the first abdominal segment. It helps anchor him in the nest when he is fending off enemies like parasitic wasps, flies, and other males of his species. The wasp here seemed to be working alone. 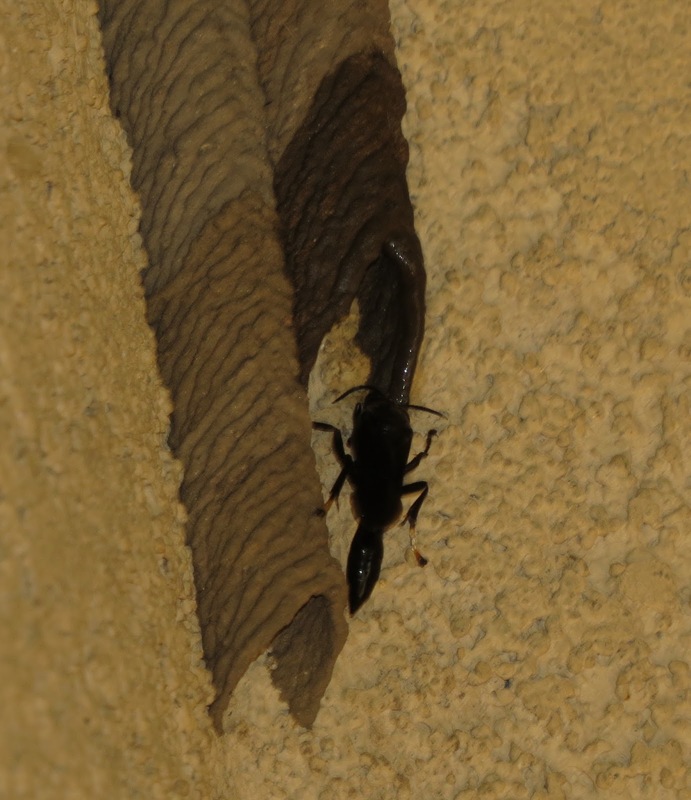 It will be interesting to see how well the Pipe Organ Mud Dauber succeeds here when we already have three species of mud daubers (including the new invasive species Sceliphron curvatum). They all coexist elsewhere, so maybe it will be the spiders that will suffer the most.